Untold Tales of Spider-Man and the Best Spider-Man “B” Title? Home » Blind Spots » Untold Tales of Spider-Man and the Best Spider-Man “B” Title? I think one of my biggest regrets I’ve had as a Spider-Man fan is the fact that I missed out on the Untold Tales of Spider-Man series the first time around. 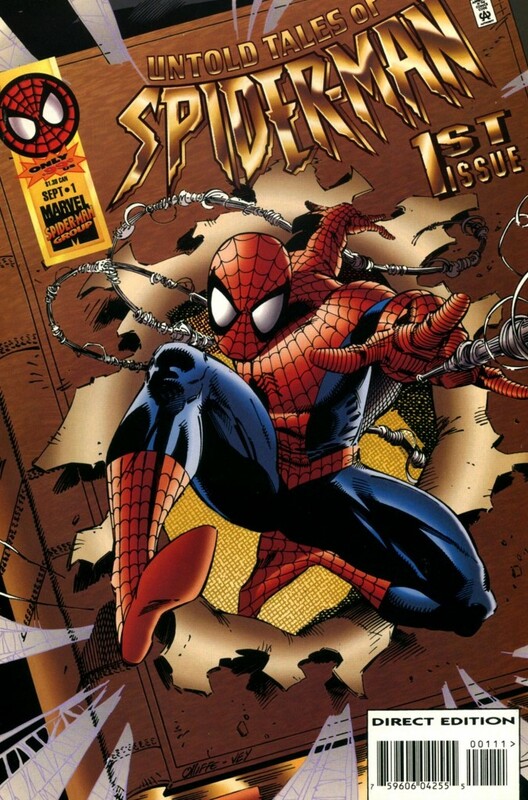 Instead, I was too busy wasting my time following the meandering “Clone Saga” from book to book, getting increasingly frustrated to the point that I flat out quit reading comics for a number of years until Sam Raimi’s Spider-Man franchise reinvigorated my interest in the medium. It could be argued that things would have been very different for me as a comic book fan if I had just ignored the “mainstream” Spider-Man books and instead opted for this curious little series that was pumped out by creators Kurt Busiek and Pat Olliffe (and at 99 cent an issue, I would have had a little more money in my wallet at the end of the month). 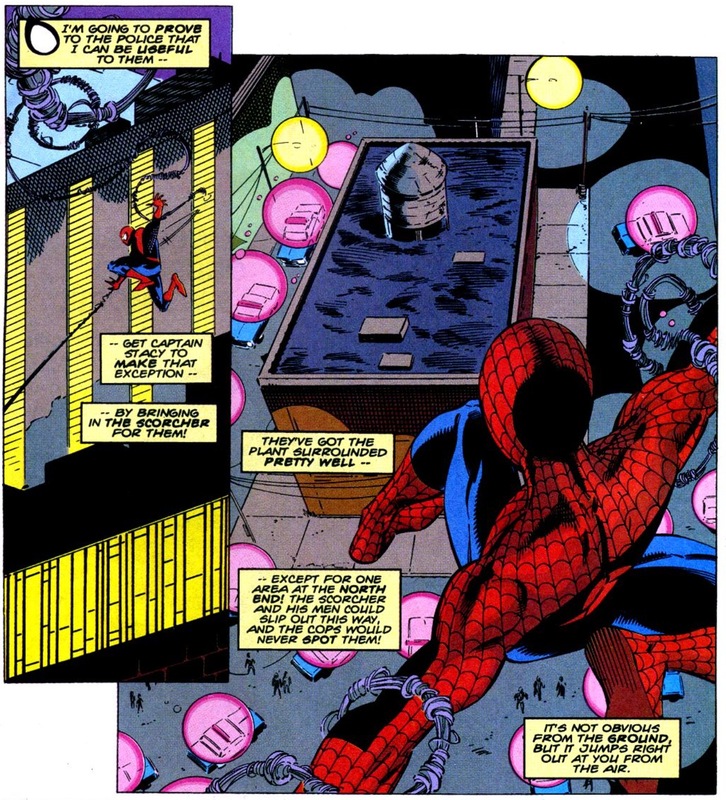 What I would have discovered was a series that was both reverential to the original source material (similar to Dan Slott and Ramon Perez’s “Learning to Crawl” miniseries), while also taking some well calculated risks that led to some of the most fun and breezy Spidey stories since the Tom DeFalco/Ron Frenz era on Amazing Spider-Man. In terms of an inaugural issue, there may be no Spider-Man “B” series that immediately hooks me as well as Untold Tales of Spider-Man #1. There’s nothing overly flashy or extraordinary about Untold #1. It doesn’t attempt to break down the Spider-Man mythos and start all over again a la the far inferior Spider-Man Chapter One. 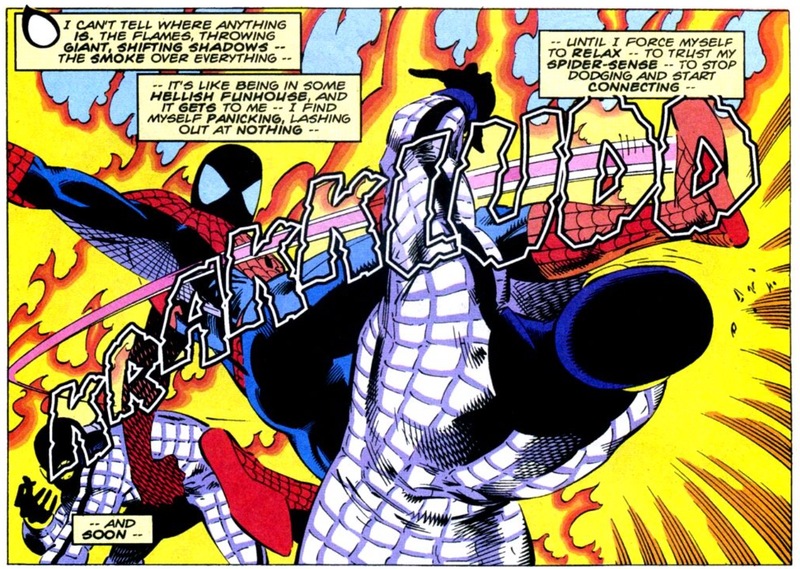 Instead, Busiek and Olliffe, with the precision of cardiovascular surgeon, operate around all of the little gaps between Amazing Fantasy #15 and ASM source material, managing to produce undeniably great new content. My biggest concern with “Learning to Crawl’s” first issue last week was the fact that despite all of the love and respect Slott and Perez show for Stan Lee and Steve Ditko, I didn’t feel that the comic illuminated anything new and exciting about Peter’s origin story that had the potential to truly grab a hold of my attention. Granted, we’re only one issue into the series, and the way Slott and Perez end things in that comic, the potential to go in a wildly different direction is there. But Busiek and Olliffe manage to bring the reader into the thick of their story with far more speed and efficiency. That’s because Untold Tales is unquestionably geared towards the most passionate of Spider-Man fans. There’s no learning curve for first-time fans, and not a lot of time spent on trying to catch up lapsed readers on why Marvel randomly decided to publish a flashback series filled with never-before-seen stories about Spider-Man. Instead, the reader is just dropped into the deep end of the pool and is forced to swim. Granted, this approach might explain why Untold Tales only lasted two years, but for folks like me who don’t need to have our hands held, it’s a magical reading experience. 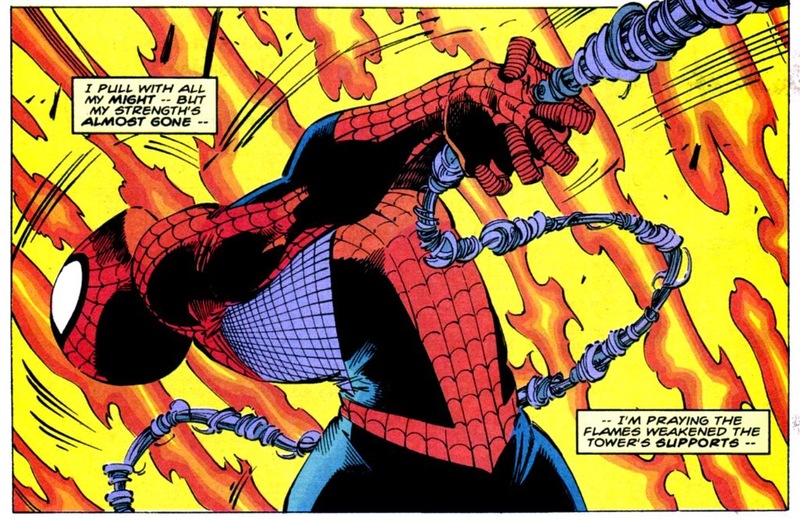 Untold Tales #1 introduces a brand new villain, the flame throwing Scorcher, while also adding all of these fun little wrinkles to Spider-Man’s early days. Scorcher is far from the most dynamic or compelling villain in the world, and if I had any complaint about Untold Tales it was that a lot of the featured bad guys created by Busiek and Olliffe for this series come across as a tad “paint by numbers.” But there are so many other outstanding character moments to latch on to in this comic, plus the final battle between Spidey and Scorcher is resolved in a very Lee/Ditko kind of way. What impresses me most about the first issue is the way it expertly weaves in and out of continuity, to the point where what’s established and what’s new blur together. 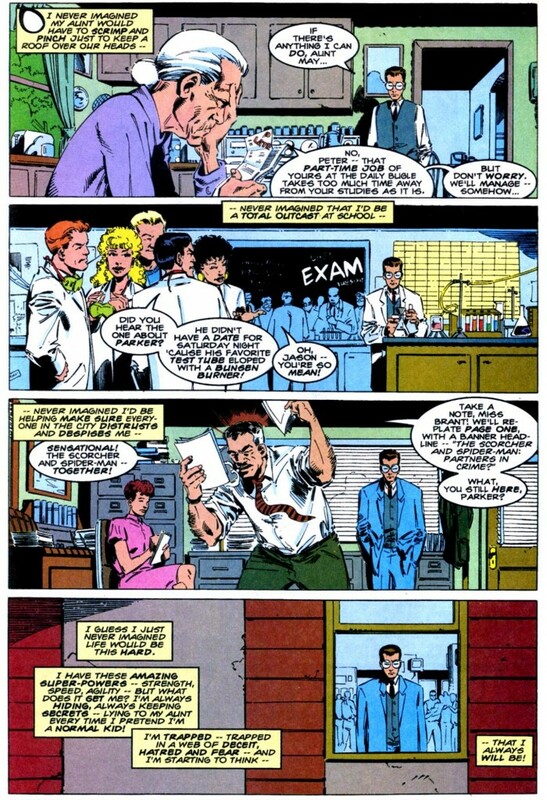 We get a number of standard Lee/Ditko-style scenes involving cast members like J. Jonah Jameson, Betty Brant, Liz Allan, Flash Thompson and Aunt May, but then Busiek and Olliffe take a bit of a risk by introducing police Captain George Stacy (complete with a photo of a high school age Gwen on his desk). And it’s not just change for the sake of change. The creative team manages to introduce new content about Spider-Man via this shift in continuity. One of Spider-Man’s defining characteristics, especially during the Silver Age, has been his frequently adversarial relationship with New York City’s police department. Hypothetically, Spider-Man and the police should be natural allies, as they both have the same goals and end game in mind – a safer New York. But because Spider-Man goes around carrying out “vigilante justice,” the cops view him as an outlaw and another distraction out on the streets. 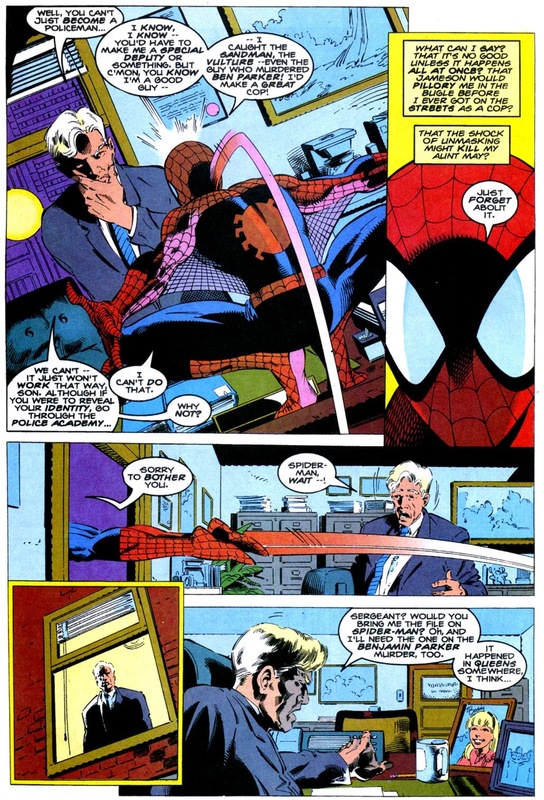 There was something that rang wholly true in this comic when Spider-Man asks Stacy if he could join the police force as a way to prove to his critics that this “Masked Menace” is really a good guy and a hero (of course, years later, Jonah wouldn’t even concede to Spider-Man when he joined “Earth’s Mightiest Heroes,” the Avengers). Stacy, who was always portrayed by Lee as having more trust and respect for Spider-Man than his colleagues in the police department, gives Spidey a very pragmatic answer – get rid of the mask and the secret identity and we’ll consider it. Spider-Man obviously declines, which sets up the comic’s fantastic ending. With Spider-Man still hell-bent on proving himself to Jonah, the police and the city, he sets out to single handedly take down the Scorcher. He traps the villain in a warehouse, which naturally sets on a fire, and corrals the bad guy for what appears to be one of the greatest victories of Spidey’s still young career. Except the police reveal that they were actually using Scorcher as bait to track down an even bigger fish – Scorcher’s mysterious boss (who turns out to be Norman Osborn). Spider-Man’s “helping” ended up causing even bigger problems for himself and the police. It’s a pitch perfect demonstration of the infamous “Parker Luck.” And the moment comes so organically and naturally, I would have never had known that this whole storyline was all “new” information (when it was published in 1995). Busiek and Olliffe would repeat this magic 26 times over (and an annual) before the series was eventually cancelled. In the years since, Marvel has occasionally tried its hand at these nostalgic flashback stories, but none have even come close to reaching the high level that Busiek and Olliffe achieve in Untold Tales. “Learning to Crawl” could emerge as a contender eventually, but only if Slott and Perez can successfully walk the tightrope between “risk taking” and “honoring the source material.” It will not be easy. I loved Untold Tales when it was released. The writing and art were a breath of fresh air in the 90’s era of over indulgence. I stopped collecting in the middle of it’s run so I haven’t read the whole thing. I’ve been debating if I want to get the Omnibus or fill in the gaps of my collection. I’m leaning towards picking up the singles since they should be cheap. A Spidey series as good as Untold should not be incomplete in my collection! I loved Untold Tales! While I was still collecting Spider-Man in the 90’s my dad did ocassionally buy other Spider-Man books for me. He would go out for Superman and come back with Batman and Spider-Man for me. So in my collection from that long ago era I had sperodic titles with some ASM, Web, Maximum Clonage, Planet of the Symbiotes, Spectacular and Adventures with some Untold and Webspinners thrown in for good measure. It was the most erratic collection of SPidey if I ever did see one. Now for a long time I was only interested in current Spidey’s those untold tales never facinated me, but dad kept buying them. It wasn’t until I was older and cracked open those old stories that I realized just how great they were and at one of those trade shows in the 50% off bin I was able to find all the holes of Untold in my collection. I’ve never completed a run whether JLA (125 issues), Peter Parker (263 issues) or 1990 Green Lantern (181 issues) that was so satisfying as this one was at only 25 issues plus -1, Strange Encounter and 2 annuals. I love Untold Tales. In my eyes they are among the best Spidey stories ever told. I only wish they had put out a second trade of the issues since the big omnibus is out of my budget. So would you recommend the omnibus? I’m more of a DC fan but love all the Spider Man I’ve read so far and have been eying the big collection at my store for a while. Great review btw! Oh yeah, if you don’t mind owning one of those big tomes, this series is totally worth it. But it does help to have read the original Lee/Ditko ASM issues (you can find those in a lot of different collections or digitally, for full context.